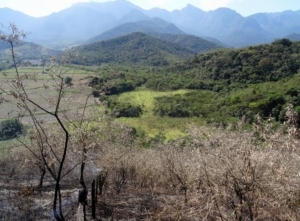 When fire broke out on land adjoining REGUA (a hillside opposite Matumbo`s small supermarket), our well-rehearsed team went immediately into effective action before the Fire Brigade arrived from Cachoeiras de Macacu town. With a very hot wind the flames were blown onto REGUA land. The fire brigade and Regua team got the fire under control. With no hesitation or thought for their own safety, all available staff fought with energy and courage, saving many of our young trees. Fires together with hot weather create a lot of damage but thanks to a quick team we were able to control it. Thank you Cachoeiras de Macacu Fire brigade for your brave help! Though hunting has been severely reduced at REGUA as a result of patrols by our rangers, it occasionally still occurs. Hunting in the area is becoming less popular – the older hunters are giving up and the younger people are not so interested in this “sport” and as a result of the development of our trail system and a decade of environmental education this pernicious action has been largely eliminated, and overall the population of animals at REGUA has increased. Camera traps have caught video of the Puma Puma concolor and bands Collared Peccaries Pecari tajacu foraging on the trails. 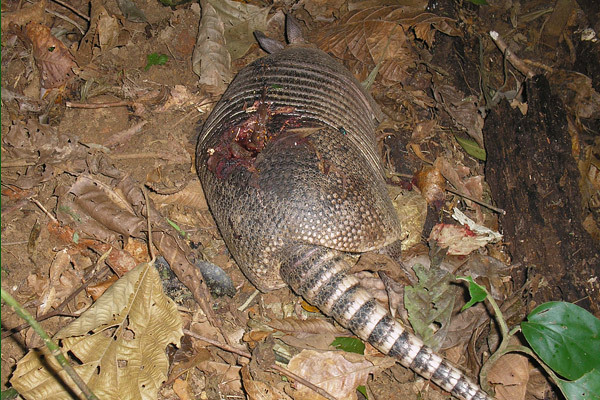 Traditionally, hunters have respected REGUA’s limits, and gunshots at night are a thing of the past, but very occasionally we see evidence of some traps and snares. As the REGUA reserve increases in size, the rangers are stretched to cover the whole area. 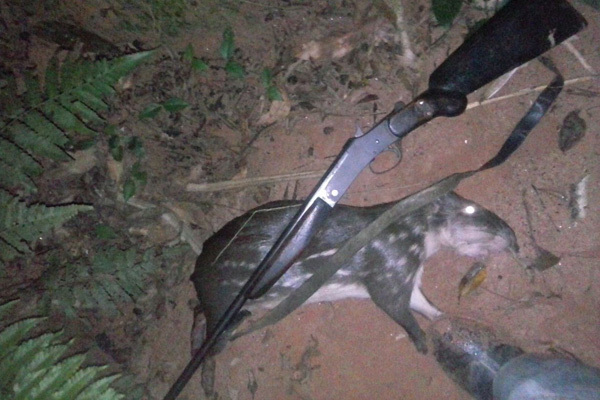 and it was quite disconcerting that one member of the local community received this photograph of a Lowland Paca Cuniculus paca kill on a distant area of REGUA land. It is painful to see the cold blooded killing of this animal and it reminds us that there are those who do not respect REGUA’s efforts to stop this sort of senseless slaughter. It reminds us that though biodiversity is rebounding from distant days, there are people out there who do not share our passion and do not care. This should encourage us to keep hard on the trail and stick to our guns – that we are gaining ground and that the forests are becoming healthier, and that our objective is worth every effort. 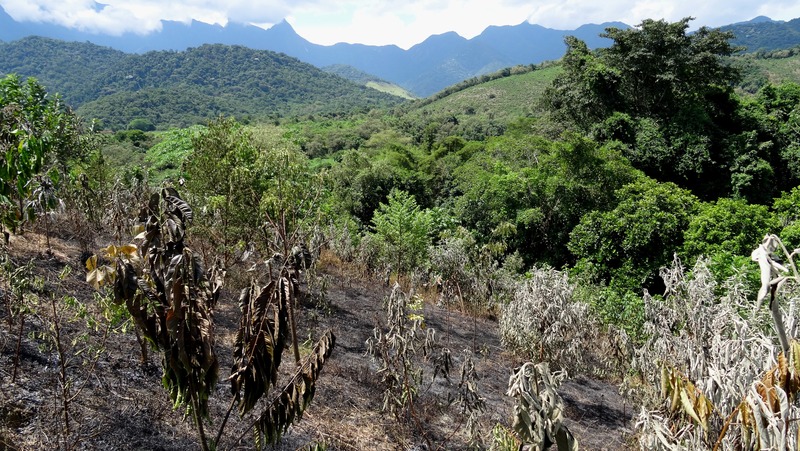 One of our UK partners, the World Land Trust, is currently appealing to raise £40,000 to allow REGUA to buy an area of forest in the Guapiaçu valley that is very much under threat from hunting as well as urbanisation. By adding this area of forest to the reserve we will be able to patrol the forest and deter hunters. Please help by making a donation to the World Land Trust Olympic Forest Reserve Appeal. Any contribution would be very gratefully received. Thank you. 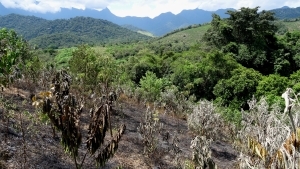 Recently, whilst returning from the lodge mid-morning Raquel and I were surprised to see a plume of almost transparent smoke arising from the Petrobras funded reforestation planting. As the plume swirled from behind a small hill of pasture, initially we thought it was a large BBQ in the local village, but we thought it worthwhile checking out, just in case. Low and behold as we approached we realized some mischievous youngster had put fire to the dead material around the young trees. Though the weather has been favourable with much rain recently, one day of sun is enough to dry things out and offer a laugh to marauding pranksters. The culprits had long gone and we soon put out the fire and the rain came down in the afternoon to help matters. Although we know this fire was not the efforts of a local saboteur angry over REGUA’s efforts in conservation, we still have to keep a close look out for this sort of action. Happily it wasn’t a large area and the plants were not too badly scorched.